If opening your freezer releases a pungent smell that forces you to take a step back, it's time for a cleaning. Chances are that food has spoiled, mildew is lurking somewhere or an old spill is starting to decay. Getting rid of the foul odor will require a thorough cleaning and sanitizing of the appliance. This process takes at least several hours, however, and stubborn smells may require a few days to resolve. Pack up your freezer's contents in an ice chest or stash your food in a friend's freezer so it doesn't thaw and spoil while you're cleaning. 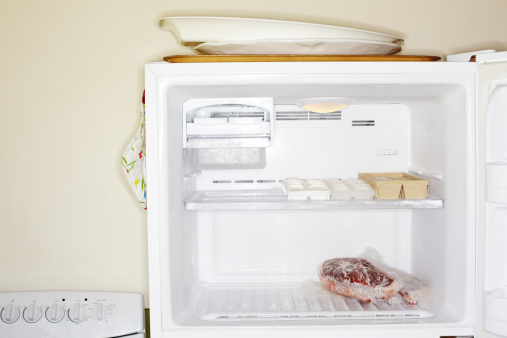 Unplug the freezer and remove all the shelves, racks, ice cube trays and anything else that you can. Wash these separately in your sink using hot water and dish detergent. After washing, sanitize the shelves and items from the freezer using bleach water made with 1 tbsp. of non-scented chlorine bleach per gallon of water. Rinse and dry all the items with a clean dish towel or air dry them. First, wipe down the inside of your freezer with a wet rag. Get up as much of the crumbs, debris and caked-on messes as possible. Lay a wet rag on top of stuck-on spills for a few minutes to loosen them. After removing the spills, clean the inside of the freezer with a mixture of hot water and baking soda mixed at a ratio of 2 tbsp. of baking soda for every 1 qt. of warm water. This helps remove any smells. After washing, sanitize the freezer using a rag dampened with a solution of 1 tbsp. of chlorine bleach and 1 gallon of water. When cleaning and sanitizing, remember to wipe down the inside of the freezer door and the sealing gasket around the door. Allow the freezer to air dry with the door open for at least 15 minutes. If the smell is gone, refill the freezer. If not, there are a few odor eaters you can try. There are some additional steps you can take if cleaning and sanitizing your freezer didn't do the trick. Try wiping down the inside of the freezer again with a mixture made of one part white vinegar and one part water to get rid of mildew smells. If that fails, soak a couple cotton swabs with vanilla, close the door and check back in 24 hours. If vinegar and vanilla fail, place a shallow dish of baking soda, coffee grounds or activated charcoal in the freezer and close the door for 10 days. Activated charcoal is available at fish and pet supply stores. You can also try packing the freezer with crumpled newspapers, replacing them every couple of days. The newspapers absorb the odors. Remove the newspapers and wipe the freezer down with a 50/50 water and vinegar mixture before putting your food back in it. If your freezer insists on smelling awful no matter what you try, you may need some backup. Freezers are encased in insulation to help them stay cold. If spills, bacteria or smells find their way into the unit's insulation, you'll never get it out. The only solution to a stinky insulation problem is new insulation. 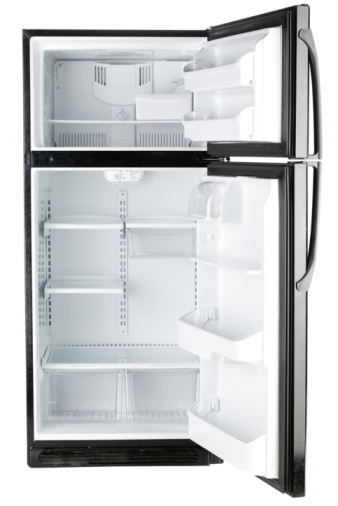 Call your local appliance repair shop for an estimate on what it would cost to replace your freezer's insulation. If the repair is expensive, it may be time to consider a new freezer.